With very limited real estate to expand along the waterfront in Lower Lonsdale, North Vancouver is facing a property shortage for residential development. Most recently, there have been plans to build only a few more high-rise condominium developments in the Lower Lonsdale area, so now is the time to purchase a condo home or townhome or residence duplex before property prices start skyrocketing in North Vancouver. Here are a few Lower Lonsdale North Vancouver condo assignment options for you at this time. Contact Mike at mike@4am.ca for more information. Great selling features of this North Vancouver assignment apartment is that it has unobstructed mountain views of all 3 local ski resorts! Open plan and all the upgrades you can imagine as well. Lock up a great North Shore condominium at 2007 prices. The boutique Envy condos will be completed late March 2008. Only pay a 15% deposit for this Lower Lonsdale condo assignment and the rest is not payable until property assignment closing at the end of January 2008 (all other boutique condo assignment sellers in Lower Lonsdale are asking for both the deposit and closing funds up front!). This is a perfect assignment opportunity to get into the Lower Lonsdale real estate market! Coming Soon! Assignments at this popular real estate development just minutes from Lonsdale Avenue and every convenience and amenity in the area, Avondale Condos and Townhomes by Palladium will be set for condominium assignment sales very soon. Although there are a few number of townhouses still available in the initial sales release, the Avondale condos are all sold out, so this is your chance to purchase an Avondale North Vancouver condo assignment at a reasonable price. Some great selling features of this Avondale assignment is that it is a ground floor level with solid hardwood flooring (not laminate, solid!) as well as a security alarm system already installed (not just pre-wiring!). Also, this ground level Plan H Avondale condominium suite has a large patio deck larger than 200 square feet that is great for entertaining and outdoor living. In addition, only ground floor condos at Avondale North Vancouver will have 9 foot overheight ceilings. There is a possibility of 2 parking stalls (right now there is 1 assigned to the unit) and further details can be provided upon Avondale condo assignment inquiry. Other great features of the Avondale condo assignments is that they include plush carpeting, soaker tubs, entertainment style kitchens with stainless steel appliances, in suite laundry and the 2-5-10 St. Paul’s Guarantee. There are currently two of these two bedroom plus den and two bathroom Avondale condominium units available once assignment sales are confirmed by the real estate developer and builder. Put your name down for the best chances to own an Avondale condo today! The expected occupancy date is end of March or early April 2008. Right now, the sales centre for Vista Place is open. Providing contemporary homes bright with promise, At Vista Place living the future couldn’t look any brighter. Homes of uncompromising quality and immaculate finish. Innovative green features that lead the way in healthy living. And a world of choice for a full and active lifestyle on your doorstep in Lower Lonsdale. Discover a landmark community at Vista Place North Vancouver that’s anything but ordinary. 604.904.8587 – 118 West 13th Street, North Vancouver – open noon to 5pm daily (except Fridays) – www.vistaplaceliving.ca. One bedrooms from $361,900, two bedrooms from $559,900, two bedroom plus den from $514,900 and townhomes from $615,900. Vista Place is over 90% sold – but select residences are still available at pre-construction pricing! Vista Place – there's still time if you act quickly! Right now, 90% of the homes at Vista Place have been sold. So buying at this landmark address has become even more of a rare opportunity. Exceptional homes in a great North Shore neighbourhood with fabulous features. And while most things of value get more expensive as supply decreases, you can still get pre-construction pricing if you act now. A Final Window of Opportunity to own at Vista Place or Ventana - Only 10% down! Hurry in as there are only 2 B1 homes remaining! With the successful launch of our showhomes and new Presentation Center the B1 homes are going quickly (Other plans still available). Come see what NOMA has to offer with our beautiful display suites featuring many of Adera's popular Signature Series Upgrade Options, lush garden landscaping, spacious rooftop decks where you can enjoy views of the North Shore mountains and Downtown Vancouver's Skyline and more! Please visit us at the NOMA Presentation Center located at 16-728 W.14th St for more information. Or call us at 604.988.9893. Open 7 days a week, noon-5pm. We look forward to seeing you. Our New NoMa Showhomes and Presentation Center are now open! With the successful launch of our display suites our homes are going quickly. These homes are available for completion starting mid December 2007. Come see what NOMA has to offer with our beautiful display homes featuring many of Adera's popular Signature Series Upgrade Options, lush garden landscaping, spacious rooftop decks where you can enjoy views of the North Shore mountains and Downtown Vancouver's Skyline and more! As shown in the pictures below, NOMA is a must see! We invite you to visit us at the NOMA Presentation Center located at 16-728 W.14th St in North Vancouver. Open daily noon to 5pm. Hope to see you soon! As a past visitor you have the opportunity to take advantage of our current NOMA Condos promotion. Receive up to 2% in Free Upgrades when you purchase a home at NOMA built by Adera, Gold Georgie Winner for Best Home Builder 2007. Our homes at NOMA are built with the environment in mind: Energy Star Appliances, Energy Star Windows, low VOC paints and water-conserving plumbing fixtures are only a few of the features of BuiltGreen*. Hurry in as this offer is only available until February 29,2008. We're located at 16-728 W.14th Street in North Vancouver, open daily noon-5pm. Less than 20 homes left! Hurry in today! If you are looking for urban townhome living in the North Shore, the NoMa North of Marine condo apartment suites will be for you. Natural materials, green design and construction, sustainable development and much more are great features of the NoMa Townhouses that are just a skip and a step away from central or lower Lonsdale, the SeaBus, Capilano Mall and great restaurants, eateries and shopping. Price from the low $400s, the North Vancouver NoMa real estate development is by Adera and is considered a BuiltGreen Vancouver condominium development. Their presentation centre is now on site at 728 West 14th Street in North Van and is now open every day of the week. According to the Westcoast Homes and Design magazine, NoMa North Van has incorporated a number of measure in NoMa to ensure its place as a leader in residential sustainable buildings and to meet the standards of Built Green Gold level development. Notes Andreasen: “Adopting Built Green British Columbia’s model as an independent third party standard for sustainable building methods provides the NoMa customer with confidence that their home was built to a minimum acceptable standards an that it will retain value when it comes time to sell.” Among the BuiltGreen features at NoMa North Vancouver townhomes: low VOC (volatile organic compounds), carpeting and wall paints, energy efficient appliances, Energy Star double pane vinyl windows, water conserving plumbing fixtures, and 100 per cent efficient individually zoned electric heating systems. NoMa is ideally situated in an emerging area of the North Shore, which is being transformed into a vibrant residential neighbourhood close to the multitude of shops, services and amenities of nearby Marine Drive. Being green does not, however, come at the cost of enjoying all the comforts a new home offers. Prices for the north Vancouver homes at Noma presales start in the mid-$400s now. Visit www.adera.com for more information. According to Susan Boyce for the New Homebuyers Guide of Greater Vancouver, NoMa (north of marine) in North Vancouver real estate provides townhomes and cityhomes that are affordable and conveniently located within the heart of the city. It’s where New York walk up loft meets trendy urban lifestyle, an upscale residence with a distinctly youthful zest and vitality. Introducing North Vancouver’s NoMa residences. Situated just north of Main at West 14th and Bewicke,NoMa North Shore residences is shaking up the way people think about townhomes. Offering more than a dozen pre-sales floor plans to choose from, these pre-construction North Vancouver NoMa condo homes are bright, sunny, and most are designed with office, den, or live/work studio space with street level entry. No cookie cutter homes here – these are individuals with a sophisticated, sassy character. And if you’re one of the peple who simply never can get enough of the outdoor living that’s such an integral part of the North Vancouver West Coast lifestyle, get ready to be wowed big time. Pre-sales NoMa townhomes and condominiums provide large patios and dekcs, some with 360 degree views of the North Shore Mountains, Vancouver, and even the Gulf Islands. Add an outdoor fireplace, barbeque and standing heat lamp from the list of Adera’s special upgrade options for NoMa North Vancouver condos and it’s like having your own vacation retreat right outside your door. Plus, North Shore NoMa town homes is BuiltGreen certified building. This independent, third party BuiltGreen NoMa certification lets you rest easy knowing your home is healty, sustainable choice – a home that will impact the environment as little as possible. NoMa North Shore still has a good selection of two bedroom homes available and priced from $469,900. North Vancouver’s NoMa townhomes presentation centre pre-sales office is located at 16-728 West 14th street on site and is open 12 to 5pm seven days a week. For more information about the pre-sales NoMa North Van real estate opportunities, please call 604.988.9893 or www.adera.com. If you missed the original release of downtown Vancouver Woodwards condominiums, act now and purchase an apartment unit via assignment. The W43 condominium tower features Suite #3307 (on the 33rd floor with great SW views of the downtown core and beyond). At an incredible price and over 660 sq ft of living space, the Woodwards condo assignment here will not last long! For more information, please contact mike@4am.ca today. We are delighted to announce that construction on Solterra's landmark tower residence Dolce at Symphony Place, is ready to commence in only a few weeks time. In order to move forward with site excavation, the Dolce sales program will be continuing out of a new location just around the corner. Opening Saturday, November 3rd at 872 Seymour Street at noon, Solterra's exciting new Dolce Presentation Centre will feature our premier tower Dolce at Symphony Place, in addition to other Solterra communities including Vita at Symphony Place, Streams at Eaglewind, Sunset Grove and more. For those of you looking for a new home, recreational retreat, or simply a wise investment opportunity – our new Solterra Presentation Centre will offer it all. As a reminder, there is still an excellent selection of homes remaining at Dolce starting as low as $429,900. We look forward to seeing you again soon. With the construction underway now on Solterra's landmark tower residence Dolce at Symphony Place, the Dolce sales program will be continuing at the new Solterra Corporate Presentation Centre, located at 872 Seymour Street. Solterra's exciting new Presentation Centre will feature our premier tower Dolce at Symphony Place, in addition to other Solterra communities including Vita at Symphony Place, Streams at Eaglewind, Sunset Grove and more. For those of you looking for a new home, recreational retreat, or simply a wise investment opportunity – our new Solterra Presentation Centre will offer it all. Final Tower at Symphony Place Dolce Presales Condos - Final Opportunity! Savvy homebuyers from across the lower mainland and overseas, all agree that Solterra's Dolce at Symphony Place is an exceptional find and rare opportunity. Since opening its doors just over 2 months ago, approximately 85% of the luxury homes in this landmark Dolce tower are already accounted for. Due to the unprecedented success of our sales program, the Dolce Discovery Centre will be closing Sunday, October 28th. For those of you looking to own at Vancouver's premier downtown address, now is your opportunity. We'd also like to invite you to our exciting Dolce at Symphony Place Condominium Vespa Giveaway Event. Join us 3pm sharp on Saturday, October 19th at the Dolce Discovery Centre located at 897 Richards Street. At this time, we will draw the winner of the fabulous new 2007 Vespa Scooter LX50, a prize valued at over $5600. There are still a variety of downtown Vancouver Dolce prime residences available in this final tower, including our exclusive Private Collection Dolce 2 bedroom view suites starting from $719,900. We look forward to seeing you again soon. Now accepting reservations. Live in the heart of Vancouver. There is something unquestionably extravagant in a state-of-the-art impeccably designed home in the very heart of the best city in the world. Announcing the Private Residences at Hotel Georgia. 156 luxurious condominiums in a sleek 48 storey tower united with a totally restored and extensively renovated dazzling world-class hotel. In the heart of Vancouver. Delightfully cosmopolitan. Deliciously exquisite. Decidedly exclusive. Presentation Gallery for the Hotel Georgia Private Residences open daily by appointment at Hotel Georgia 699 Howe Street, Vancouver. Call 604.682.8107 or toll free 1.866.602.6636 or visit our website at www.residencesatgeorgia.com. Vancouver's Private Residences at Hotel Georgia Opening Day Record! Congratulations to all the new homeowners who bought at The Private Residences at Hotel Georgia's Selection Event. The quality of the downtown Vancouver real estate project combined with its rare location, the strength of the Vancouver property market and the high confidence in our Canadian economy all contributed to setting a new opening day record! Well over 50% of the Private Residences at Hotel Georgia Vancouver were selected for a total of over $200 million, including the spectacular 7,000 sq ft Penthouse which sold for $18 million. In fact, they are talking about us all over the world. You may have read some of the recent articles published in the; New York Times, South China Morning, The Post, Edmonton Journal, Calgary Herald, Vogue magazine, Business in Vancouver and the front page of The Vancouver Sun [any articles about the Private Residences Hotel Georgia available upon request]. Needless to say, Delta Land is moving forward with the restoration of the heritage Hotel Georgia along with the construction of the Residential Tower immediately. We are therefore announcing that the Hotel Georgia Presentation Gallery will be closing in December 2007! Before we start moving out, we want to encourage all of you to stop by as we still have a great selection and have been given permission to sell at Opening Day prices for a limited time. Call us or visit us by appointment. We are open from noon to 5:00pm daily. We look forward to seeing you at the Vancouver Private Residences Presentation Gallery before we close our doors. The Private Residences At Hotel Georgia Is Pleased To Announce Our Spring Release Of 25 Exquisite Homes in downtown Vancouver's real estate market. We are now accepting Appointments for our Spring Release of luxury condo residences, with sales commencing April 5th through to April 20th. The earlier your appointment is secured, the better selection you will have. If you have yet to tour our Vancouver Private Residences at Hotel Georgia Presentation Gallery, now is the right time to schedule a visit. The excitement is building around the Hotel Georgia, with the recent announcement of "Hawksworth" as the new Signature Restaurant. Famed chef David Hawksworth will be at the helm of what is sure to be one of Vancouver's finest establishments. Also bringing her expertise to the mix is Maureen Wilson, the mastermind behind local and Hollywood favourite, Sweatco Studios. Her new facility in the Private Residences Vancouver Hotel Georgia will provide hotel patrons and residents with a broad range of personalized health and wellness options. Award-winning chocolatier, Thomas Haas, is poised to open his first ever shop outside of North Vancouver, with a retail location in the Hotel Georgia Private Residences in downtown Vancouver. Hotel Georgia Private Residences Presentation Gallery - 549 Howe St., between Pender and Dunsmuir. There will always only ever be one. Now open for Spring release with only 25 homes available at the most prestigious floors of the Private Residences at Hotel Georgia in downtown Vancouver’s real estate market. These pre-construction condos will be available for preview between April 5th to 20th with appointments being accepted right now for eventual purchase. The new presentation gallery for these pre-sales Vancouver Private Residences at Hotel Georgia downtown residences is now open by appointment at 100-549 Howe Street, Vancouver. One block north of The Hotel Georgia. 604.682.8107 and complete with a new look marketing web site at singularliving.com. A singular residence in a singular hotel in downtown Vancouver real estate scene. The Private Residences at Hotel Georgia Vancouver pre-sales are a singular and unique living experience. As a resident, the impeccable services and amenities of this elegant and luxurious hotel will be at your disposal every day that includes: valet parking, maid service, dry cleaning, room service from David Hawksworth’s new dining room, and resident’s private online concierge. Residences in the downtown Vancouver real estate market at Hotel Georgia will start from $1.3 million. Registrations are accepted now and are marketed by Sotheby’s International Realty Canada. A special advertisement feature for the Private Residences at Hotel Georgia new condo development in downtown Vancouver real estate market. In a market crowded with towers. The Private Residences at Hotel Georgia offer something completely unique that could only happen in the Vancouver property market. Only one location like this: on the corner of West Georgia and Howe Street, across the Art Gallery, surrounded by boutiques and gourmet restaurants, this is the most vibrant central location in all of Vancouver. In the heart of the Luxury District, this is truly an exclusive address at the Private Residences at Hotel Georgia Vancouver condo development. An irreplaceable history: For 80 years, the Hotel Georgia in Vancouver downtown real estate has been the hub of Vancouver’s social life. All the stars, the royals, the heads of state stayed here. This is a place with a past that can’t be duplicated: the only luxury Vancouver residence anchored by a significant heritage landmark. A singular hotel; All the best hotels in the world are not part of a chain. They are singular and unique. Our mission is to make the Hotel Georgia residences in the new Vancouver condo market the most elegant hotel in Canada. For those Private residents lucky enough to live here full time, the services and amenities of this luxury property will be yours to enjoy every day. Intelligent floor plans at these new Vancouver condominium residences at Hotel Georgia: Floor plans have been designed to simplify your daily life. Consider the J Plan included in this package as an example. Notice there is a real foyer. The separation of bedrooms in your new condo Vancouver Residence at Hotel Georgia. The placement of the media room next to the kitchen. Every floorplan at the Hotel Georgia Private residences in downtown Vancouver is carefully constructed to make you feel right at home. Vancouver’s best chef: Not content with just any restaurant, we’ve asked David Hawksworth, formely of West (www.davidhawksworth.ca) to open his signature dining room here at the Residences at Hotel Georgia new Vancouver condos. Your home will be adjoined to the best restaurant in Vancouver real estate. Want room service? No problem. And think how delicious it will be. Canada’s most celebrated interior designer: Instead of a corporate team, we’ve approached individuals in every field who are the best at what they do. Interior designers Mitchell Freedland (www.mitchellfreedland.com) is a perfect example of the downtown Vancouver Residences at Hotel Georgia condo homes. Well known for his sophistication palette and attention to the smallest details, his extremely high standards will be immediately evident throughout your home. An experience real estate developer: for more than 20 years, various real estate Vancouver developers have tried to undertake the redevelopment of the Hotel Georgia. It took the Delta Group (www.deltalanddev.com) with their years of experience developing luxury condo towers in Vancouver and around the world, to make this project at the Private Residences at Hotel Georgia a success. An exclusive alliance with Sotheby’s: for 263 years, the Sotheby’s name has been synonymous with luxury. Sotheby’s International Realty Canada (www.sothebysrealty.ca) represents only the most extraordinary properties, properties such as the Private Residences at Hotel Georgia. Every condo suite at the Private Residences at Hotel Georgia will be a luxury suite. But The Sotheby’s Suites will be more luxurious still. The Private Residences at Hotel Georgia Sotheby’s Suites include: a fully equipped kitchen by Chef David Hawksworth, right down to the pots and pans and a complete furniture package by William Switzer or Livingspace Interiors. Spring release of homes begins on April 5th, 2008. There are only 25 pre-construction and presales homes at the Private Residences at Hotel Georgia that are available and the residences start from $1.3 million. Registrations are being accepted now: www.liveatthegeorgia.com or 604.682.8107. There is a plethora of adjectives that can effectively describe downtown Vancouver’s real estate market: explosive, mystifying, epic, opulent, and so on. But for those in the know, one term gives an especially realistic amount of the situation: built-out. The supply of premium real estate development sites in the downtown core is rapidly dwindling, a reality tha makes a property development like The Private Residences at hotel Georgia all the more intriguing. Fusing heritage preservation with cutting edge high-rise development techniques, the project places the legendary hotel next to the striking 48 storey residential tower. Designed by renowned IBI/HB Architects, the building at The Private Residences at Hotel Georgia seamlessly blends the traditional elegance of the Hotel Georgia with a highly contemporary architectural achievement. “We’ve designed a residential condo tower with a very distinct sculputural form<” says Bruch Langereis, president of Delta Land Development Ltd. “Designer architects tend to hijack a building’s livability, but because we took the time to meticulously plan and test-drive our suite layouts, we found teat perfect balance between form and function.” The Private Residences at Hotel Georgia will be completely renovated under the direction of architects Endall Elliot Associates and consulting heritage Robert Lemon. Owners of the private residences will have access to all the luxurious amenities available at the hotel, including an ozonated lap pool, a professionally staffed fitness club, spa, sauna, yoga and pilates studio, dry cleaning, valet and room service, professional wine cellar, 24 hour concierge plus various entertainment and meeting facilities. The 156 Private Residences at Hotel Georgia occupy the top 35 floors of the condo tower in downtown Vancouver real estate, the majority which will boast brilliant views of the cityscape,, ocean and mountains. Equally impressive are the plus living spaces that have been created by the internationally acclaimed interior designer Mitchell Freedland. Designed fror the ultimate in livability, purchasers at the Private Residences at Hotel Georgia may choose from two distinct sets of quality materials and finishes. The newly opened showroom, located at 549 Howe Street, is now available for viewing from noon to 5pm by appointment only. For more information, call 604.682.8107 or visit www.residencesatgeorgia.com. Thank you for your continued interest in Vancouver’s Lumen at Granville Island, a sleek 5 storey building boasting just 62 exceptionally planned homes. Not only are the LUMEN homes at Lumen Granville Island well planned with the latest designer finishes but they are also designed to exist in harmony with the environment; employing some of the latest advances in sustainable building technology. From geothermal heating to intelligent metering, the homes at Lumen Condos Vancouver are designed to respect the Earth while also respecting your bottom-line. Just 5 minutes out of downtown, and ideally located on the quiet cherry-tree lined street of 3rd avenue, Lumen Vancouver Condos is just blocks away from Granville Island. Lumen Condominium Residences is a short walk from the exciting shops and restaurants of West 4th, Kitsilano beach, the retail shops on South Granville & Broadway, and of course, major transit locations to take you anywhere you need to go. Although originally intended to open for previews in August, the Vancouver civic strike has unfortunately delayed the issuance of permits necessary for us to open to the public. We apologize for the inconvenience this delay may have caused you, but you have our word that we will continue to update you with the latest information as soon as it becomes available. We thank you for your patience and look forward to launching Granville Island’s LUMEN Vancouver condos presales as soon as possible. Thank you for your interest in Vancouver's Lumen at Granville Island, a brand new community by Bucci. As a valued Lumen Condominium Residences registrant we would like to invite you down to our Presentation Centre in Granville Island Vancouver with display this weekend to preview the exciting designer homes at Lumen. Lumen Condo Residences Vancouver is an exclusive community of just 62 homes located on the quiet tree-lined street of West 3rd Avenue. Just steps from Granville Island, West 4th Avenue, South Granville, Kitsilano Beach, and downtown, Lumen Condominiums puts you at the centre of everything you need. Contemporary architecture greets you in this sleek 5 storey Lumen community while modern interior finishes and close attention to detail create dynamic and functional homes. Lumen Granville Island Condos also offers the latest in sustainable building technology with intelligent metering and geothermal heating and air conditioning for maximum convenience while saving you money and helping the environment. Too bad life doesn’t come with a pause button, explains Intracorp’s real estate marketing for the Jacobsen condominium real estate developments in Vancouver. Fortunately, you can watch the same show every night from your private deck. There are a few select homes available at Jacobsen, clean mid-century modern inspired homes bordering on Vancouver’s newest community – Southeast False Creek. New live/work homes at Jacobsen with intelligent use of space, over height ceilings and views of Southeast False Creek, downtown and beyond. One bedroom and den Jacobsen condo homes from $391,900. Open noon to 5pm except Fridays. Presentation Centre for Jacobsen residences is at 2501 Main Street (SW corner of Main and Broadway). Visit us today at www.jacobsenliving.ca or call 604.709.9844. It may surprise you to learn that there are still some fabulous homes available at JACOBSEN. That's good for you because JACOBSEN is on the border of South East False Creek and will benefit from all of the added amenities about to be implemented in the rejuvenation of this area. South East False Creek will be the next great new community of Vancouver's inner core, and JACOBSEN promises to be a solid investment for homeowners. And now, for a limited time, you can purchase a home through our mortgage payment buydown promotion with payments from $1,233 / month*, including CMHC fees and the GST. 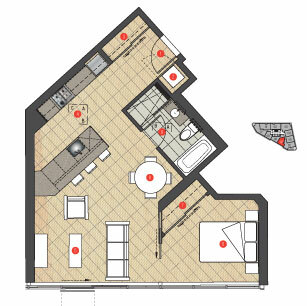 Our pre-construction pricing starts from as low as $391,900 for a one bedroom plus den. Hurry in to our Presentation Centre on the corner of Broadway and Main to take advantage of this fantastic promotion! For more information, please call and speak with one of our sales representatives at 604.709.9844. JACOBSEN is open daily from 12:00 noon to 5:00 pm with the exception of Friday. * Limited time offer, ask sales representative for further details. Today, if you want to buy a new home in Southeast False Creek, you will find that it will cost you more than $800/square foot. Downtown Vancouver , you can pay as much as $2,000 a foot. So, it should come as a pleasant surprise to learn that the few remaining homes at Jacobsen False Creek Condo residences are priced at only $532/square foot! That is an exceptional real estate property value when you look at the quality of the homes at Jacobsen Condos and the excellent location adjacent to Southeast False Creek. But, if it seems too good to last, you're right. The Vancouver Jacobsen Sales Centre will be closing very soon. So, this will be your last opportunity to own a home at Jacobsen for such a reasonable price. But that's not all. Buy a Jacobsen Residence in Southeast False Creek for only 5% down plus 5% Bond* if you qualify. With the remaining 1 bedroom + den homes priced from $369,900 to $409,900, that means that you could purchase a new, modernist condo home at Jacobsen for as little as $18,500 cash deposit. Please stop by our presentation centre at the corner of Broadway and Main and speak with one of our sales representatives for more information. JACOBSEN is open daily from noon to 5:00pm with the exception of Friday. Your Life Illuminated. This is illuminated living with 62 luxury concrete condo homes now previewing at the LUMEN at Granville Island condominiums residences. Located at 1679 West 3rd, the LUMEN presentation centre is open daily between 12 – 6 except Fridays and you can call at 604.731.9199 or email info@lumenvancouver.com for more information. Contemporary and sleek, LUMEN at Granville Island offers enlightened design with open floorplans, geothermal heating/cooling, smart metering, modern kitchens and spa-like bathrooms for maximum livability, style and sustainability. Located in the enviable Granville Island neighbourhood on a quiet tree-lined street, the homes at LUMEN condos combine incomparable style with an unbeatable location. There are 62 residences at LUMEN available, from studios to 2 bedroom homes. Lumen at Granville Island is currently previewing which means if you have not been down to visit our Presentation Centre yet, you can come in anytime prior to the 16th. We are open from 12-6pm daily (closed Fridays) and we encourage you to come down and experience all that Lumen has to offer firsthand. This 5 storey contemporary community at the Granville Island LUMEN condo suites is located on a quiet tree-lined street along West 3rd Avenue in Vancouver and has just 62 concrete homes. Boasting unique features such as geothermal heating and air conditioning, intelligent metering and highly functional modern interiors, Lumen Residences has already experienced overwhelming interest. Granville Island homes range from 469 sq.ft. studios to 808 sq.ft. 2 bedroom penthouse with view. As a valued registrant at Lumen Granville Island condo residences we would like to remind you that Lumen is holding its VIP Selling Event this weekend! Simply give us a call at 604-731-9199 to book an appointment for your opportunity to own at Lumen! The 5 storey contemporary community of Lumen is located on a quiet tree-lined street along West 3rd Avenue in Vancouver and has just 62 concrete homes. Boasting unique features such as geothermal heating and air conditioning, intelligent metering and highly functional modern interiors, Lumen has already experienced overwhelming interest. Homes range from 469 sq.ft. studios to 808 sq.ft. 2 bedroom penthouse with view. Our Presentation Centre at LUMEN Granville Island real estate is located on the corner of 3rd and Pine Street in Vancouver and you can also visit our website at www.lumenvancouver.com or call us at 604-731-9199 for more information. Words you want to live by. Form takes a new meaning with a concrete building, inspired contemporary architecture and sophisticated interiors designed to maximize space at the new presale Vancouver LUMEN at Granville Island condo residences. Floor to ceiling windows frame artistic views of water, city and mountains. Function is redefined with Bosch and Blomberg appliances, geothermal heating and coo9ling, and engineered hardwood floors. And the great location at West 3rd and Pine places LUMEN Vancouver apartment residences at the entrance of Granville Island real estate community. Modern presale LUMEN Vancouver residences now selling. Located at 1679 West 3rd at Pine Street and open daily from 12 to 6pm daily (except Fridays). Please contact 604.731.9199 or visit LumenVancouver.com for all the details. According to News 1130, the president and CEO of the Holborn Group real estate developers has confirmed that the downtown Vancouver Ritz-Carlton condo hotel is a go as far as construction is concerned. Although the exterior of the building architecture will remain the same (designed by world renowned architect, Arthur Erickson, who recently passed away), the interior floor plates for the condo high-rise tower will be completely changed. By decreasing the number of Ritz Carlton Vancouver hotel units and increasing the number of floors of market condos, the Holborn Group will also decrease the average size of each unit in terms of square footage and number of bedrooms, allowing for more affordable and entry level suites for sale. The spiraling tower of 60 storeys may not keep the Ritz Carlton brand, and that is yet to be determined as of this point. The downtown Vancouver Ritz Carlton condo hotel should start construction later this fall 2009. However, the City of Vancouver may not grant construction permits until after the 2010 Olympics. Expected completion for the 'four star' Ritz Carlton Vancouver condominium hotel should be around 2011 if construction begins this year. Just reported on February 24, 2009 by multiple news stations, the status of the delayed Ritz-Carlton Vancouver pre-construction condo development has now been confirmed by the Holborn Group real estate builders. Joo Kim Tiah, president of Holborn Group, said today that the downtown Vancouver condo project on hold at the Ritz-Carlton Vancouver designed by Arthur Erickson architecture, will be canceled and NOT delayed. With time, the Holborn Group will decide what to do with the site, but for now, any pre-construction condo pre-sale home buyer at the Vancouver Ritz Carlton cancellation will get their original deposit back. This is of great relief to many pre-sale condo buyers here at the Ritz-Carlton Vancouver on hold who will get their deposit money back and be able to buy a new home or invest in a new property sooner rather than later. The $500 million condominium high-rise tower residences on hold and cancelled was to be a ground breaking development that would push the limits in architecture and was dubbed 'Vancouver's Turn' by Arthur Erickson and his architectural team. The original plans for the Vancouver Ritz-Carlton on hold was for a sixty story high-rise condo tower that would twist 45 degrees up to the top. On the lower floors would be the high-end Ritz Carlton hotel suites (much like the Shangri-La Vancouver across the street) and the upper floors would have housed the luxury Vancouver Ritz-Carlton condo suites canceled that were priced between $2.5 to $10 million. The Ritz Carlton penthouse suite was priced at an astronomical $28 million. According to Joo Kim Tiah, about 62 of the 123 pre-sale condo suites were sold, and that was not enough to move the condo project forward in an attempt to complete by 2011. Located at the 1100 block of West Georgia Vancouver, the Ritz-Carlton condo project canceled is now officially put on hold and not delayed. Pre-sale canceled Ritz Carlton condo buyers will receive letter starting this week to inform them that the Vancouver Ritz Carlton cancellation and that their deposits will be returned. According to many experts, the cancellation of the Ritz Carlton Vancouver condo project on hold are signs of the times and affordability is the key to successful developers in the near future. According to Metro Vancouver newspaper and written by Derek M, the developers Holborn Group is trying to save the Arthur Erickson building design for downtown Vancouver’s ulta luxury Ritz Carlton condo-hotel that was planned for development earlier before the economic crisis. There are hopes now that the sixty storey condominium skyscraper across the street from Shangri-La Vancouver Downtown design by the late Arthur Erickson can still be constructed in downtown Vancouver at a later date, according to the Holborn Group, but not solid plans have been signed off as of yet. Arthur Erickson’s twisting condo tower, the Vancouver Residences at the Ritz-Carlton was slated to rise on West Georgia Street this year, but the condominium building project was halted in the wake of the global economic crisis that has plagued many downtown Vancouver condo real estate developments in the past year. Those homebuyers who purchased Ritz-Carlton condo residences in Vancouver are going to get their deposits back hopefully soon. Speculation has been rife that the eye catching Arthur Erickson condo tower will be shelved in favour of a less ambitious designed apartment building, if anything is to be built on site by the Holborn Group. But in an interview with Metro Newspaper, Joo Kim, president of the Holborn Group said that the developer still wants to see the Arthur Erickson Ritz Carlton condo Vancouver residences skyscraper being built on the prime piece of downtown Vancouver real estate and the City of Vancouver wants to work with them to see it through. According to Joo Kim, the Holborn Group wants to keep the design of the condo building. The developer is looking to re-price the Vancouver Residences at Ritz Carlton condos by taking advantage of lowered costs for construction as well as raw materials, if the condominium building gets the go ahead. Therefore, the new pricing if the Residences at Vancouver Ritz Carlton if approved will be much less than the original pre-construction condo pricing. The recent passing away fo Arthur Erickson, one of Canada’s most accomplished architects, has put a new focus on shoring up the Vancouver native’s home town legacy and the construction of the new Residences at Ritz Carlton Vancouver condo tower will certainly help in keeping his legacy alive for sustainable and green urban living in the downtown core. As of February 2009, the Residences at the Ritz Carlton Hotel Condo real estate development in downtown Vancouver will not be proceeding as planned. The proposed condominium hotel would have stood opposite of the Shangri La Hotel Condo residences on Georgia Street in downtown Vancouver, but the developer, Holborn Group, cited poor pre-sales and a global economic downturn that has lead to the cancellation of the Vancouver Ritz-Carlton project. Designed by Arthur Erickson, the canceled Residences at Ritz-Carlton Vancouver was to twist 45 degrees from base to top, making a striking impression on the downtown city skyline. Named Vancouver's Turn, the Ritz Carlton condo hotel residences were about fifty per cent pre-sold, not enough to proceed. A 127-room luxury Ritz-Carlton hotel was supposed to occupy the first 20 floors of the building, with condos taking up the top 40 floors. The estimated cost for the completion of the project was roughly five hundred million dollars, and with the lower than expected pre-sales for the Vancouver Residences at Ritz Carlton and with no end in sight for the economic turmoil, the Holborn Group had to chance to complete the project while making a profit. All pre-sale condo buyers will receive a letter before the end of the month indicating that the Vancouver Ritz-Carlton Residences have been canceled (and not put on hold or delayed as earlier reported), and that their initial pre-sale condo deposits will be returned. Back in October 2008, there was much speculation to the future of the Ritz-Carlton Vancouver condo hotel as the marketing was pulled off site and pre-sales were not going forward. At that time, many speculators thought that the project had been delayed or put on hold. As of today, Arthur Erickson and Holborn Group's Vancouver's Turn at the Residences at Ritz Carlton condo hotel has officially been canceled. The only loosers in this entire Vancouver condo cancellation is the Vancouver skyline as the striking glass facade high-rise tower would have been a perfect landmark for this beautiful city. According to several news stations today, construction has been stopped on the Arthur Erickson designed Ritz-Carlton Vancouver condominium hotel high-rise tower that was dubbed the 'Vancouver twin towers' opposite the street of the tallest Vancouver condo, the Shangri-La tower. Not much is known right now regarding the status of this pre-construction Vancouver high-rise in the heart of downtown, but Rennie Marketing Systems has stated that the Ritz-Carlton Vancouver condo hotel stoppage has not been affected by the world wide credit crunch or problems with the developer. Right now, Rennie has suspended all sales (pre-sales) for the luxury condos at the Ritz-Carlton Vancouver condominiums until further notice. The Holborn Group, the developer for this massive highrise tower residence has apparently re-evaluated some of teh designs for the structure in addition to the attached parkade for the site. As it stands, construction has just started on the presale Vancouver Ritz-Carlton condo hotel residences and there is a hole on Georgia Street between Bute and Thurlow, across the street from Shangri-La which has topped out construction. The proposed downtown Vancouver Ritz-Carlton hotel condo real estate development was supposed to be a 58 storey condo tower and the price tag for the Holburn Group was stated to be around five hundred million dollars. According to City of Vancouver officials for planning and real estate development, the Holborn Ritz-Carlton condominium hotel designed by Arthur Erickson is a passed project, and nothing has changed on their end at all. Therefore, the problem lies probably on the developer/builder end. Some early speculations even with the re-assurance from the Rennie Marketing Group is that the Holborn Group developers have come into a credit squeeze during this financial downturn and have decided to either scrap the proposed Vancouver tower project all together or to suspend construction until further monetary details for completion are decided upon. Right now, Rennie states that about 50% of all the suites at the Ritz-Carlton Vancouver condo hotel are pre-sold, leaving half of the pre-construction units unsold, which is a far cry from the heydays of getting into the downtown real estate market and long line ups. Excavation remains only 50% complete as of October 2008. Right now, there is no word from Rennie or the Holborn Group as to when construction will begin again and when presales for the Ritz Carlton hotel condo in downtown Vancouver will start. If the Ritz-Carlton Vancouver condo-hotel project is cancelled, it is unclear when and if pre-sale purchasers will get their condominium deposits and downpayments back. Right now, there are many questions as to the future of this landmark condo tower designed by Arthur Erikson that would have changed the Vancouver downtown skyline for the best. Vancouver’s Ritz-Carlton – The Peak of Luxury Living. Published in the Westcoast Homes & Design magazine in Sept 2007 and re-posted here to promote the pre-construction Vancouver condo development. The Residences – High above the Ritz-Carlton Hotel Vancouver to be built on West Georgia, residents of the Arthur Erickson – designed suites will enjoy the benefits that come from their close attention to the renowned hotel chain. Imagine waking up to stunning views of Coal Harbour, Burrard Inlet and the North Shore mountains. Then imagine calling in-residence dining for croissants and coffee. Your newspapers are at the door, compliments of high-tech Crestron systems linking directly to hotel services. Should you prefer to make your own breakfast, groceries are available at nearby high-end shops such as Urban Fare and Capers. Perhaps you’d enjoy a day in the spa, a soothing swim or simply window-shopping in the lobby’s signature boutiques. And all this in your own home at the Vancouver condominium Ritz-Carlton residences. This kind of luxury living will be available at the Arthur-Erikson designed suites at The Residences at The Ritz-Carlton, Vancouver, due for completion in 2011 at 1151 West Georgia Street, one of the last remaining major downtown sites in the city. The site of the planned building is on West Georgia Street between Thurlow and Bute, across fro the soon-to-be-completed Shangri-La Tower. For a decade, the real estate building ont eh site has been an empty shell with posters pasted on its exterior walls and interminable protective framing overhanging the Georgia Street sidewalk. Three years ago, Holborn bought the land from Cadillac Fairview. Arthur Erikson along with Musson Cattell Mackey Partnership and Davidson Yuen Simpson designed the building, appropriately named “Vancouver’s Turn.” Demolition of the old building at the Ritz-Carlton Vancouver residences site is under way with construction due to start next year. The five-star suites at the Vancouver Residences at Ritz-Carlton will range in size from 1,000 to 4,000 square feet and be priced between $1.5 million to $13 million. By offering larger sized units, Holborn expects to attract Vancouverites downsizing from neighbourhoods such as Point rey, Shaughnessy, Kerrisdale and West Vancouver. In keeping with the grandeur of the planned condo tower, The Residences at Ritz-Carlton wil feature European-influenced spaces with streamlined modern designs and generous light-filled interiors. There will be a private residential lobby and a sophisticated lounge. European styled kitchens and bathrooms will be outfitted with signature names such as Bulthaup, Poliform, Miele, Sub-Zero, Dornbracht and Durant. Finsihes in the suites at the Vancouver Residences at Ritz-Carlton will include polished marble, limestone, lacquer and travertine and woods in walnut, oak, and elm, accented with stainless steel and chrome. One of the great advantages of this upscale, downtown address will be the close connection to The Ritz-Carlton, which will manage the entire complex. There will be 24-hour security, and concierge and residents will have the use of the hotel spa, pools and staffed fitness centre. Residents may also access casual and fine dining in the hotel. Extra services will include a private valet service, meeting and conference rooms, housekeeping and staffing for special events if required. 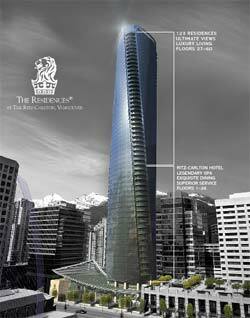 The Residences at Ritz-Carlton Vancouver promise high-style, luxurious downtown living. To make an appointment, contact the presentation centre at 1090 West Georgia Street, 604-689-8881. For VIP priority, register online at www.vancouversturn.com. Arthur Erickson will change Vancouver's skyline forever. You are invited to a fashionable affair. Join us for an evening of luxury and desire, celebrating The Residences at The Ritz-Carlton, Vancouver complemented by a Holiday Gifts Preview by Holt Renfrew. RSVP: Jenny Lee by November 16, 2007 at 604.682.2088 or vancouversturn.com/vip. Complimentary valet parking. The much anticipated completion of Vancouver real estate's tallest condominium tower residence is now ready for move-ins and occupancy as the new Shangri-La Vancouver condo hotel opens its doors to pre-sale purchasers and pre-construction homebuyers. Located in downtown Vancouver, the Shangri-La Condo Hotel real estate development has taken a little more than 2 years to complete and is located in the heart of the city core close to the trendy Robson Street shopping and dining corridor, Stanley Park urban green spaces, the waterfront Coal Harbour community as well as transportation routes. The new Vancouver Shangri-La Condo residences and luxury condominiums are now complete and with the finest finishes in any condo tower in downtown, early home buyers who purchased pre-sale units will be very pleased with the end result. Looking north are unobstructed views of the North Shore Mountains and facing south, you get the best views of the Vancouver city skyline. From many mid to high level floors in the newly completed Shangri La Vancouver condo hotel residences, you will also see fabulous views of the water, English Bay and Lion's Gate Bridge to the west as well as the Burnaby skyline and beyond to the east. Completed and considered the tallest condo building in all of Vancouver real estate, the Shangri-La Vancouver condominium hotel towers is ready for occupancy for resident units. The hotel accomodation floors of the high-rise Shangri-La Vancouver condo tower will be ready for visitors later in the year as well and they are just finishing the final touches of the grand entrance lobby and building amenities. At one point last year, some city officials dubbed the Shangri La Vancouver Condo Hotel and the Ritz-Carlton Residences across the street as the 'twin towers' of Vancouver real estate. With the uncertain future of the Ritz Carlton Vancouver condo project that is now put on hold due to 'changes in the design of the garage', the new homebuyers and home owners at the Vancouver Shangri-La condo hotel will have a quiet community to move-into as well as fabulous unobstructed views facing north for now. Because the pre-sales of the pre-construction downtown Vancouver Shangri-La condominium hotel suites happened before the proposed Ritz-Carlton Vancouver condo project was passed, pre-sale homebuyers at Shangri-La condo Vancouver tower did not know whether or not their views would be obstructed and whether they would have to endure at least two years of construction noise across the street. Now, the the Holborn Group Ritz-Carlton Arthur Erickson designed condo tower being stalled and put on hold indefinitely, the residents at the newly completed Shangri-La Condo Hotel Vancouver luxury high-rise residences will enjoy great views and stunning panoramas in every direction. This high-rise should be the tallest building in downtown Vancouver for years to come and will be the landmark tower for the 2010 Olympic Winter Games. As of early October 2008, the marketing team and developer of the new Shangri-La Vancouver condominium hotel has sent closing letters to pre-construction homebuyers stating that completion and occupancy should happen sometime in late October, early November, representing one of very few downtown Vancouver real estate projects that is actually considered to be on time and on schedule. Featuring the first Shangri-La condo hotel in all of North America, Vancouver real estate has exponentially increased in unsold inventory of presale condos this year, and many who bought pre-sale units at the Shangri-La Vancouver condo hotel have not been able to sell their suites via assignment condominium sales. However, for the majority of home buyers in this high-rise Vancouver downtown condo tower, they are primary residence purchasers, meaning that their recently completed Shangri-La Vancouver condos are ready for them to move-into. For those who wanted to sell their presale Shangri-La Vancouver condos via assignment, those speculative buyers will now have to close on their condominiums or walk away from their deposit (which also has legal implications as the developer can sue them according to the purchase of sale contract). After closing, these speculative downtown Vancouver condo real estate investors will then have to re-list their new Shangri-La condo hotel residences in the flooded inventory of new suites in downtown. In any case, these stunning residences at Shangri-La Vancouver represents the first highrise condominium hotel project ever and will start a new trend in luxury homes with fabulous views and an impeccable location. If you are looking to purchase a new condominium at the Vancouver Shangri-La Hotel Condo, now is the time to find basement bargain pricing for absolutely new residences. For condominium sales, please visit www.livingshangri-la.com. The Shangri-La Hotel in Vancouver Canada will be opening its doors for the first time in January 2009, a year away from the 2010 Winter Olympic Games in Vancouver/Whistler. Not only is this an exciting time for the luxury real estate market in downtown Vancouver in addition to adding one of the most prestigious hotel chains to its tourism destination fold, the Vancouver Shangri-La Hotel Residences is a one hundred and nineteen room five star boutique accommodation with striking architectural design. Located in one of the most high-end neighbourhoods of all of Vancouver downtown, the Shangri-La condo hotel residences is the best of cosmo urban West Coast life where you can truly experience the best that this city has to offer. Developed by the Peterson Investment Group and Westbank Projects Corp, the deluxe Shangri-La Hotel Vancouver Condo residences and boutique accommodations in downtown Vancouver will be at West Georgia and Thurlow District, in the heart of the business district, close to high end retail shops, shopping malls, boutique dining experiences, live/work downtown condominiums and the Vancouver Art Gallery. You can also stay inside and relax at the Chi Spa at Shangri-La Vancouver Hotel. The hotel accommodations occupy the first fiftenn floors of the new sixty one storey mixed-use Shangri-La Vancouver Condo Hotel high-rise, the tallest structure in the Greater Vancouver area. Not only that, these boutique hotel residences at the Vancouver Shangri-La will come with the most extravagent features and finishes that you would wish for in any five star hotel room. With a portion of these luxury condo homes purchased by Vancouver real estate investors and foreign property owners, a number of these boutique downtown Vancouver Shangri-La condo hotel residences will be available for rentals during the 2010 Winter Olympic Games. Ranging from one bedroom to even three bedroom suites that can occupy anywhere from three to eight people at a time, the new Shangri-La condo hotel Vancouver residences will be an ideal place for visitors to call home during the Winter Olympics 2010 as they will be centrally located to all of the downtown amenities, urban conveniences, local mountain ranges and city venues. Not only that, the Shangri-La Vancouver Condominiums will also be practically brand new (only one year old during the 2010 Vancouver Olympics), making them ideal rental suites for visitors. The Shangri-La Vancouver rental condos during the Olympics can range anywhere from one bedrooms at $1000 per night all the way to three bedrooms at $5000 per night if you are lucky to get one of these suites. The Vancouver Winter Olympics dates are in March 2010, making the rental condominiums at the Shangri-La Vancouver condos for rent, the best place to stay if you are looking for luxurious living experiences in the most beautiful setting. Another great article by Carly K for 24Hours Vancouver talks about the recently completed downtown Vancouver Shangri-La condominium hotel tower. At 61 stories (the tallest building in Vancouver) and after three hundred million (one of the most expensive real estate developments in all of Canada), to say the Shangri-La Vancouver condo is grand is quite the understatement. But what really sets Vancouver’s newest and swankiest hotel/condo, which officially opens its doors tomorrow morning, apart are the tiniest of details. Sure, there’s the Vancouver Shangri-La Chi Spa with its vast water wall that greets you upon stepping off the elevator, the hugely hyped restaurant by French chef Jean-Georges Vongerichten, towering bamboo trees flanking an outdoor Vancouver Art Gallery art plaza, a 42 seat private screening room, and of course, the limestone, three story lobby presided over by six gorgeous and gigantic old world chandeliers here at the recently completed Vancouver Shangri-La condo hotel residences. But we’re more impressed by the small stuff: The miniature versions that sparkle in each stall of the lobby washrooms and the post-it-note sized silver foil painstakingly applied by hand to pillars and cove ceilings. And the grand piano in the Shangri-La Vancouver lobby bar boasts a little signature by the famed maker/concert pianist Mr. Fazioli, himself. Leather semi-circle banquets in the restaurant have received a small yet thoughtful touch, sure to be appreciated by visiting filmmakers breakfasting over top-secret screenplays: Sound-proofing. The new Shangri-La Vancouver condo hotel residences itself has even had minor adjustments to ensure it meshes with its environment. The Shangri-La Vancouver condominium glass tower has been tinted blue to match the sky, on a good day. And it’s on a slight angle to maximize the city’s light, or lack there of. Even the employee uniforms have a tiney touch of the unexpected here at the downtown Vancouver Shangri-La condo hotel opening. Under their subdued mandarin collar jackets are flashes of striking emerald green, hot pink or racy red lining. Something that isn’t small, however, is personnel. The Shangri-La Vancouver downtown hotel condos (Vancouver is number sixty, and theonly one in North America until the one in Toronto is complete in a few years) pride themselves on service and boast two staff to every one geust room ratio. Also not diminutuive is the price. A room on one of the first 15 floors (16 through 61 are condo residences at Shangri-La Vancouver, including three penthouse suites), will set you back $345 to $3,400 per night.